Twenty years ago Tunisian fishermen were able to fish octopus off the coast, but changes to the climate mean that is no longer possible. Efforts to mobilize the cash needed to ensure that climate change does not lead to the irreversible damage of Tunisia's coastline are being undertaken by the North African country's government, with the support of the UN Development Programme (UNDP). 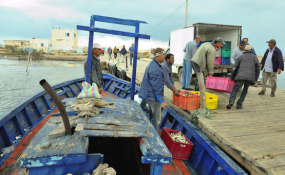 Tunisia's extensive coastal areas are a crucial part of its economy providing tourist dollars and opportunities for income-generating activities like fishing.